In electronics industry, protecting devices from ESD damage is a must. Electrostatic discharge or simply ESD is a very high voltage spike that can easily damage small signal components such as integrated circuits and low power semiconductors. A common ESD is caused by human body touching to electronic devices. Charges are accumulating inside human body and then when any part of the body touches to anything, these charges will discharge that associate with very high voltage spike. I will not discuss too much on the definition of ESD because I know you can search for it anywhere in the net. In this article I will emphasize several ways on protecting devices from ESD damage. This is very important in electronics industry. These techniques for me are purely theoretical before; but when I started my career in electronics design these are already become proven and tested methods. The use of clamping diodes is most commonly used in integrated circuits in protecting devices from ESD damage. Microcontrollers, digital signal controllers and processors are having internal ESD clamping diodes. However, low cost controllers sometimes don’t have it internally and the user must consider putting it externally. Figure 1 is the implementation of ESD clamping diodes inherent to the ICs. At normal operation, say the voltage in pin 1 is expected to be within 0-3.3V, D1 and D2 will not interfere. Supposing the high level is 3.3V, D1 is reversed biased and non-conducting. On the other hand D2 is non-conducting also since the cathode is connected to Vcc and the high level of the pin is equal to Vcc. When the voltage in pin 1 is zero, D2 is reversed biased and D1 is unbiased. When there are high voltage spikes caused by ESD, these diodes conduct. For instance the spike is very high positive, D2 will be forward biased and the spike will be diverted to Vcc thus protecting internal components of the IC. When there is a very high negative spike, D1 will conduct and divert the spike to ground. It is important that you know if your IC has this protection. If none, implement these clamping diodes externally as shown in Figure 2. Are you going to implement these clamping diodes in all the pins on the IC? Absolutely not! It is very costly. Usually ICs are no longer accessible after the product is built and put into enclosure. There are just few specific pins that are needed to be implemented with these clamping diodes. Clamping diodes are can be a silicon diode or schottky. Usually these pins are exposed and accessible to human. Some products needs to be reprogrammed in the field and the possibility of ESD on these pins are high. Another reason to include clamping diodes on these pins is compliance. If you are going to market your product internationally, you need to comply ESD standards. In ESD testing, exposed pins are purposely injected voltage spikes and the product must not damage. We do not want that our design will reset or restart without any valid reason. Sometimes reset pin is externally accessible and when ESD is happening on it, the device may restart or damage permanently. During other compliance tests such as surge, the reset pin may be disturbed and the unit will restart which is not the expected outcome (although this is not an ESD case but since the level of the surge voltage spike is very high, this simulates ESD). These IC pins are actually not accessible externally and ESD is remote possibility on this pins. However, during surge testing or actual surge these pins might see higher voltage spikes and these spikes are like ESD in nature. It will damage the IC right away if the spike is unclamped based on experienced. Transient voltage suppressors are fast acting clamping diodes. These are not ordinary PN diodes such as the one to use as clamping diodes above. 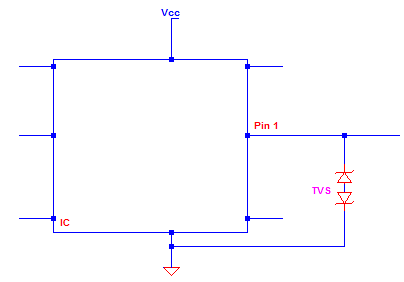 TVS (short for transient voltage suppressor) is comparable to Zener diode in terms of operation. Once its breakdown voltage is reached, the device will clamp. Otherwise, it is an open circuit. Figure 3 shows the common TVS symbols. Figure A and B are bidirectional TVS while C is a unidirectional one. Bidirectional TVS can block ESD either positive or negative spike. On the other hand, a unidirectional one can only suppress one directional spike. Figure 4, Figure 5 and Figure 6 are sample connections on how to use TVS to protect a specific pin against ESD. Above is showing a unidirectional TVS installed in an IC pin. At normal operation of the circuit the TVS is non-conducting. When there is positive spike the device will clamp. When there is a negative spike, the device will be forward biased and diverts the spike to ground. Above is implementing a bidirectional TVS. At normal operation the TVS will not interfere. 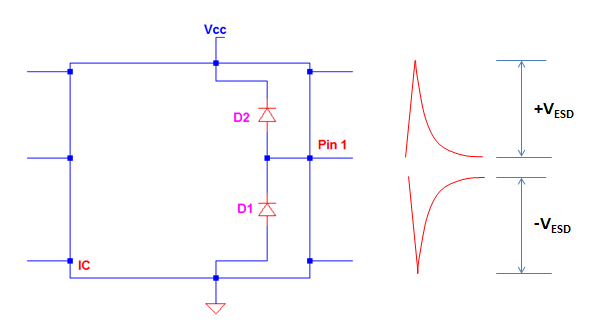 During positive or negative voltage spike, the device will clamp and protect the IC. Below is also implementing a bidirectional TVS. At normal operation the TVS will not interfere. 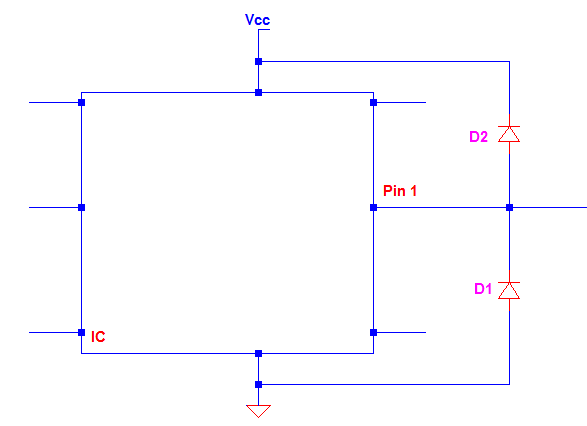 During positive or negative voltage spike, the device will clamp and protect the IC. 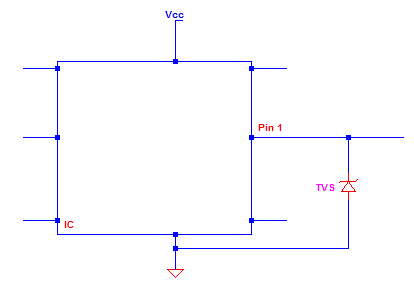 Using Zener diode as ESD protection has the same principle as unidirectional TVS. The disadvantage of Zener diode is that it is not as fast as TVS and it can handle only a smaller energy considering the same size to TVS. You need a larger Zener diode to withstand the energy and this consumes board space and may be expensive. The most common ESD is caused by human. In automotive circuit designs, a human body is assumed having 330pF equivalent capacitance. This capacitance can store potential as high as 8kV. When a man touches to anything, the charge within his body will discharge. If it is small electronics devices; it will simply damage. Now, how to prevent ESD from damaging electronics devices using capacitors? 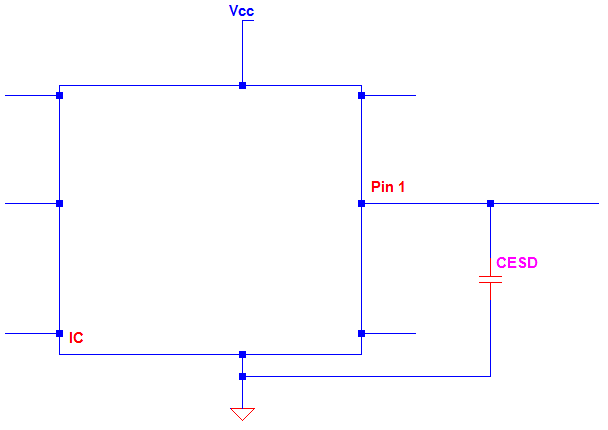 Below setup is showing how a capacitor installed in the pin of an IC to be protected by ESD. 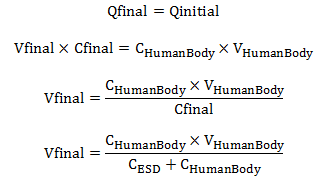 When a human body touches the pin, the capacitance on the human body form a parallel connection to the capacitor CESD. Because of this, the 8kV potential in the human body will be suppressed. So, with a 33nF ESD protection capacitor installed in the pin, the voltage that the pin experienced is only 79.2V instead of 8kV. The capacitor voltage rating must be higher than this. If you want to further decrease the level of the voltage, just increase the ESD capacitor. However, increasing the capacitor further will increase its size. You may select on which approach do you prefer in protecting devices from ESD damage. Each approach have its strength and weaknesses per application. You may very its effectiveness in the actual test. Hello! I want to protect my computer from power voltage spikes and surges and I don;t know what is better to choose – to buy UPS for computer of to install overvoltage system (like this one http://hardware.eu/overvoltage-protection/phoenix/2838199.html) to protect all house equipment. As for me such system is quite expensive… but maybe it is worth that money? What can you recommend me? Is your location very prone to line voltage spikes? If yes, it is a good idea to use the over voltage system since it will protect all your appliances. However, if over voltage or spike will happen only very very rare case such as lightning, you may not need over voltage protection for your computer as long as your computer has certificates from CE. If your PC has CE logo on it, it is tested for input surge voltage following IEC 61000-4-5. The power supply on that computer if provided by a third party has also complied the IEC61000-4-5 surge standard. We are power supply designer/manufacturer and we always comply this standard to get certification. We have incorporate surge protection to our power supply.